I don't recall ever eating a peach in Vietnam. Here, in northern California, peaches are abundant and deliciously sweet in summer. Although I never cared from them much when growing up, I've become very fond of them in recent years. I particularly enjoy white peaches, which have an ambrosial sweetness. 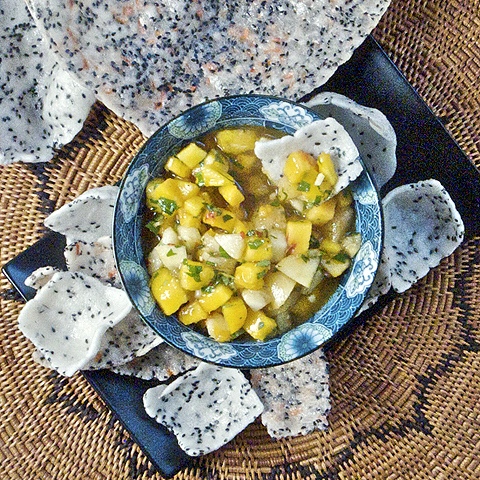 This recipe came about when I was chewing on some rau ram (daun laksa) and thought it would be an interesting match with peaches. I was right. This salsa would be great with grilled fish, chicken, or pork. It also goes nicely with arugula for a quick summer salad. 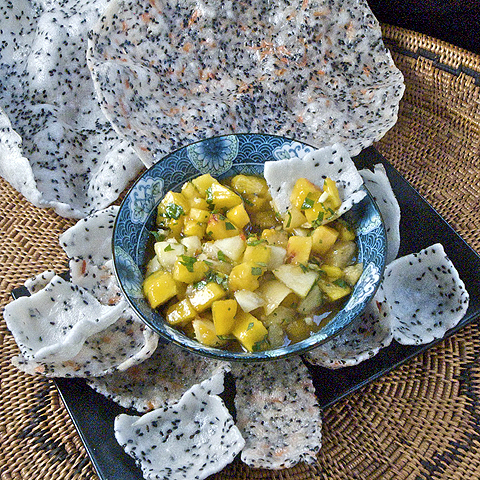 Here it is simply served with Vietnamese sesame rice crackers--banh trang me--which I crisped in the microwave. As with most salsas, this is quick and easy to prepare, and tastes best the day it is made. You could certainly add more shallots, make it spicier with more chilies, or vary it to your taste. The rau ram should be easily found in Vietnamese markets. It is the herb that makes this a Vietnamese salsa for me. Mix ingredients together in a bowl. Wait 20 minutes for flavors to meld. Can be made several hours ahead of time, but best served the day it is made. 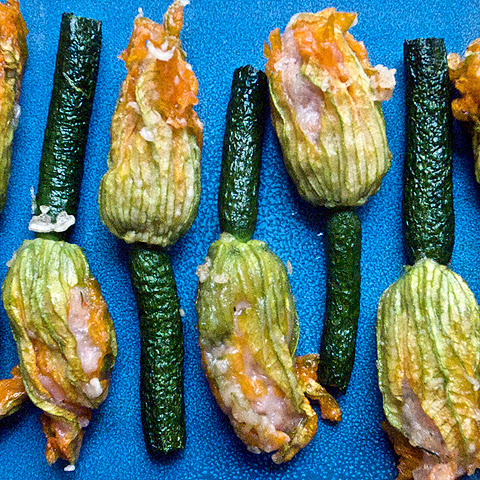 Stuffed squash blossoms are a seasonal treat. 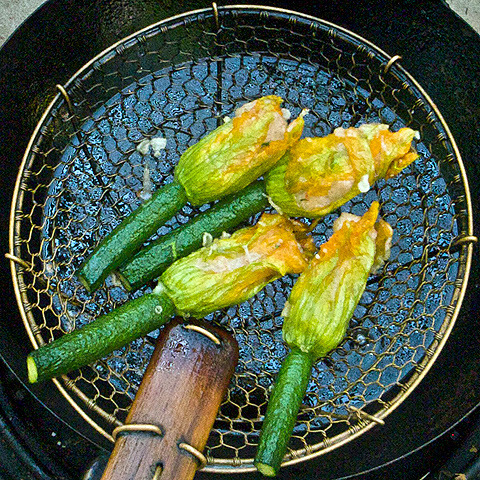 I love the Italian version with ricotta and mozzarella, and am equally fond of these Vietnamese inspired blossoms. I first tasted ones similar to these in Can Tho, on our last visit to Vietnam several years ago. The ones we had that night were good, but a little heavier than this version. I believe the stuffing for them was a pork and shrimp forcemeat. 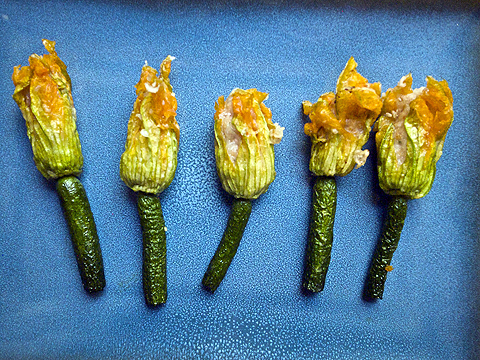 Even in season, squash blossoms are ephemeral treats. Within a day they wilt and wither. When I spot some good ones at the farmers market, I cannot resist them. Never mind if I had other plans, when squash blossoms are available I will make something with them. These shrimp stuffed ones go nicely with an evening cocktail. I have made these with a thicker batter, but prefer this lighter, virtually transparent shell. 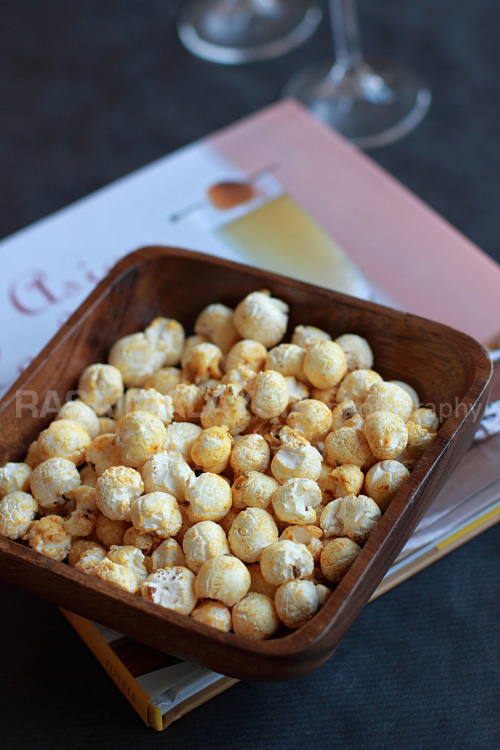 It provides a crisp skin to the blossoms without detracting from their delicate nature. The shrimp stuffing is fragrant with kaffir lime leaves and young ginger. I do not coat the zucchini with any batter at all. 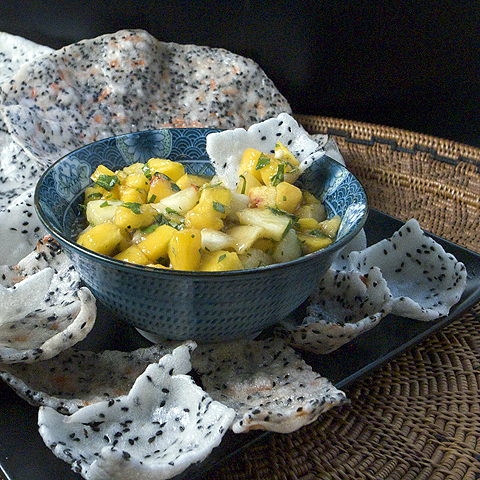 I accompanied these with a simple nuoc cham for dipping. In a food processor, pulse the shrimp mixture until well mixed. Remove the stamen from inside the blossom, rinse and drain. Pat dry with paper towels. Put the shrimp mixture into a pastry bag. 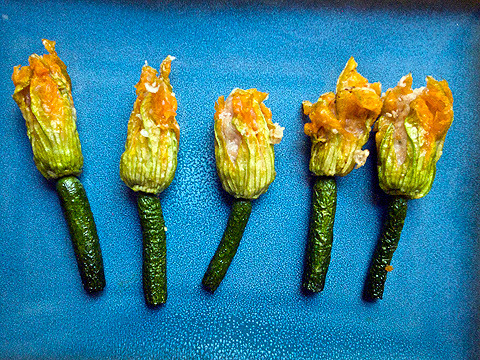 Pipe a tablespoon or so of the mixture into the squash blossoms. If the blossoms tear, just press against the shrimp filling to hold together. Heat oil to the depth of about 2 inches to 350ºF. In a small bowl, add enough cold water to the rice flour, cornstarch and salt to make a thin batter. Using the zucchini as handles, dip the stuffed blossoms into the batter. 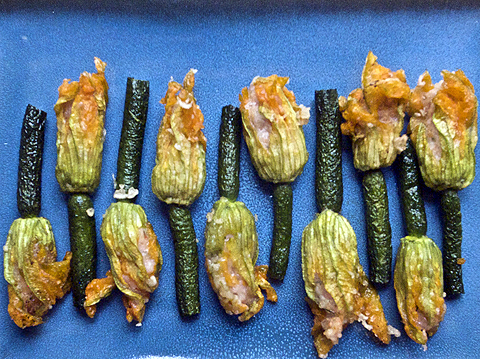 Slide the battered blossoms into the hot oil and fry for about three minutes. Remove from the oil and dry on paper towels. 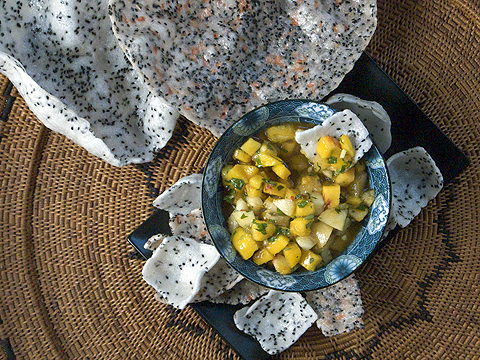 These are best served warm with some nuoc cham for dipping.